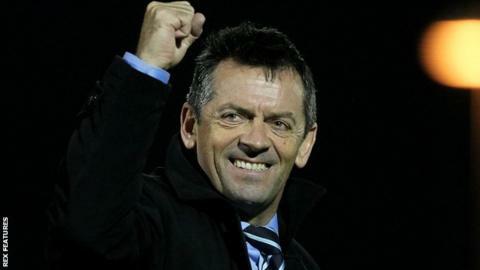 Southend boss Phil Brown says he would buy all 231 fans that made the 384-mile round trip to see them beat Shrewsbury on Tuesday a pint if he could. Stephen Hendrie's 79th-minute winner gave Brown's 10-man side a 2-1 victory to lift them to seventh in League One. "Tuesday night at Shrewsbury in the middle of winter, my word you have to be an absolute stalwart of a supporter," Brown told BBC Essex. "I would like to buy every one of them a pint on their way home if I could." Brown, who saw Michael Timlin sent off before Hendrie's winner, continued: "It was great to get the winning goal in front of them as well - they wouldn't have seen the amount of defending we had to do in the second half. "Decisions seemed to be going against us. I thought it was going to be 'we'll play until they (Shrewsbury) score' - that's the way the referee seemed to be refereeing it at the end - but hey-ho, we got the victory in the end and everybody has played a massive part in it." Southend suffered three straight defeats around New Year to drop off the play-off pace, including a 4-0 home loss to Millwall. But after a 0-0 draw at fellow top-six hopefuls Peterborough, they have now won both of their subsequent matches going into Saturday's derby with Colchester. "I think we turned a corner with the 0-0 draw at Peterborough - certainly (Southend goalkeeper Dan Bentley's) penalty save in the 95th minute was a key factor with regards to then getting two wins on the bounce," said Brown. "We seem to be catching teams at the right time which is always nice, if you're going to get success timing is going to be important."